The FLIR Lepton® is a radiometric-capable long-wave infrared (LWIR) camera module that is smaller than a dime. It is specifically designed to fit inside a smartphone, mobile devices, and other electronics like IR sensors and thermal imagers. 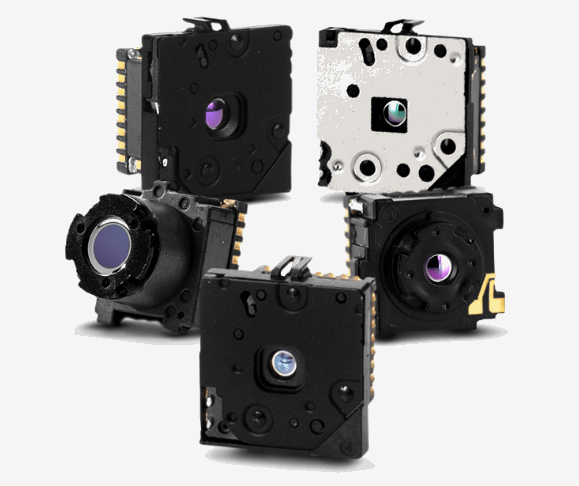 Available at one tenth of the cost of traditional IR cameras, these cameras feature focal plane arrays of 160 x 120 or 80 x 60 active pixels, and capture accurate, calibrated, and noncontact temperature data in every pixel of each image. The Lepton modules have unbeatable SWaP for mobile devices, and greater sensitivity than common thermopile arrays. These micro thermal imagers are designed for easy integration, and simplifying development and manufacturing of thermal enabled devices. Temperature Compensation: automatic, output image independent of camera temperature. For more information on the FLIR Lepton camera modules, download the datasheet, or check out the video below.